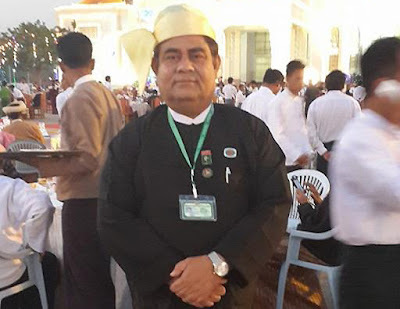 YANGON, Myanmar — As an elected lawmaker and member of Myanmar’s governing party, U Shwe Maung attended dinners with the president and made speeches from the floor of Parliament. But this weekend, the country’s election commission ruled that despite more than four years in office, he was not a citizen and thus was ineligible to run for re-election in landmark voting in November. Mr. Shwe Maung’s plight is but one example of what appears to be the mass disenfranchisement of the Rohingya, a persecuted Muslim minority who number around one million in Myanmar. Hundreds of thousands of Rohingya who cast votes in elections five years ago have been struck from the electoral rolls, election commission officials have confirmed, although without providing a precise number. The final list of eligible voters is due by the end of August, but it is unlikely that any Rohingya will be added given anti-Muslim feelings in the country, Rohingya leaders say. Persecution of the Rohingya has escalated in recent years with the rise of a shadowy Buddhist nationalist movement that has demonized Muslims and encouraged the eviction of Rohingya from the country. Although many Rohingya have lived in Myanmar for generations, hatred has built up against them and they are referred to as Bengalis by the government, a name that implies they belong in neighboring Bangladesh. Yet until now, they have never lost the right to vote. The Rohingya have taken part in every election since Myanmar became independent from Britain in 1948, including one-candidate elections during the rule of the military dictator Ne Win. Mr. Shwe Maung, who left the governing party earlier this month to run as an independent, was informed by fax on Saturday that he had been disqualified for re-election. The election commission said his parents were not citizens at the time of his birth, an assertion that he calls absurd: His father was a career-long officer in the national police force. Mr. Shwe Maung is appealing the disqualification. The election on Nov. 8 has been described by Western governments and human rights organizations as a major test of Myanmar’s nascent democracy because it is the first time since military rule that democratic forces, led by the Nobel Peace laureate Daw Aung San Suu Kyi, will be vying in a general election against the military-backed governing party, the Union Solidarity and Development Party. Voter registration lists released by the election commission in June showed that more than 500,000 Rohingya had vanished from the rolls, Rohingya activists say. U Kyaw Min, a former schoolteacher who is president of the Democracy and Human Rights Party, a Rohingya party, says the number of eligible voters in a single district, Buthidaung, fell to 27,000 from more than 150,000 in 2010. Mr. Kyaw Min, who is Ms. Wai Wai Nu’s father, says one of his earliest memories is of accompanying his mother to vote in Buthidaung in the 1956 election. The election commission says it cannot allow Rohingya to register to vote because they do not have proof of citizenship. Earlier this year, President Thein Sein, acting under pressure from Buddhist nationalists, decreed that the special identity cards held by the Rohingya, known as white cards, would no longer be valid and that Rohingya would have to undergo a citizenship test in order to obtain new cards. Tens of thousands of white cards were surrendered to the government. Other Rohingya lost all their possessions when they were chased from their homes by Buddhist mobs in a series of deadly pogroms that began in 2012. More than 140,000 Rohingya remain in government camps in Rakhine State on Myanmar’s western coast. Thousands more have fled the country by sea this year, leading to a regionwide migrant crisis. The election commission says it cannot bend from its position: People must prove their citizenship before being able to vote. “If the immigration officers cannot issue the cards in time, they cannot vote,” said Thant Zin Aung, assistant director of the election commission. The widespread hatred toward Rohingya in Myanmar stems partly from resentment held over from colonial times, when the British brought Indians into the country, then known as Burma, as laborers and civil servants. Today, Buddhist nationalists warn of a threat of the Islamization of Burmese society and point to the swollen population of Bangladesh next door. U Thar Pwint, a lawyer in Rakhine State who describes himself as moderate, says Muslim culture is not compatible with Buddhist society. “Their culture does not allow living together with other cultures,” he said. He proposes a radical solution for the Rohingya that is heard often among Buddhists in Myanmar.